On this page you can find some of my private VST Plugin creations. 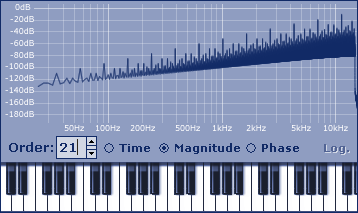 The plugins you can find here are some of my very first steps in digital signal processing. Toadstunnel (Bit-Crusher) was one of my very first VST-Plugin. I made it to demonstrate how easy it is to make VST-Plugins. 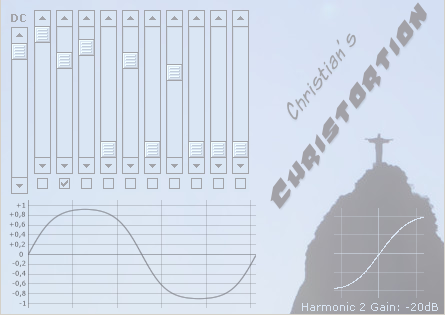 Christortion uses a Chebyshev polynom waveshaper to excite harmonics of the input signal. Each harmonic can not only be adjusted surgically in dB, but also the phase of each harmonic can be inverted. With this concept you have a very wide range of distortion that can be produced. The plugin itself is donationware. You can still use it and share it for free, but I would be very happy if you donate some money. I’ve been responsible for the entire series of VST-Plugins from the vendor Audiocation. If you want to download the plugins, please visit their website. For demonstration purpose of a publication at the institute where I studied acoustics, I once wrote this little synthesizer, that creates sinc-interpolated fibonacci sequences, that can be pitched to any desired frequency without aliasing. While the idea sounds interesting, the sound of these serious is rather annoying. Especially since harmonics tend to be louder towards higher frequencies, whereas normally it’s getting more quiet. Thus it’s hard to hear a fundamental. 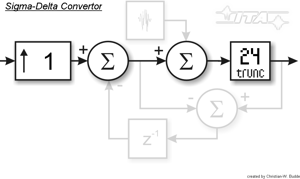 This plugin demonstrates how Sigma-Delta-Converters work. It is kept quite simple, so don’t expect a good sound. But you can really learn a lot! Just try it!!! This plugin demonstrates how compander systems work. Although there is a patent on this technology, I have continued the development for private, internal use. This is legal, but I can not publish the plugin anymore. If you are willing to know more about this technology and if you want to use this for research or educational purpose, I might still send you a PRIVATE copy.